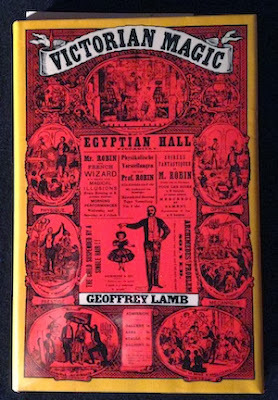 I recently stumbled upon a book on eBay called 'Victorian Magic'. It's a hardbound book by Geoffrey Lamb published in 1976. I was unfamiliar with the book and many of the auctions for the book had it listed at $40 and above. Fortunately for me I was able to find it for a little more reasonable price. I must say, it's a really enjoyable history on Victorian Magic. There are a number of things in here that I was not familiar with. The book opens with a chapter on The Great Wizard of the North, John Henry Anderson. The chapter also discusses a lesser known competitor and some of the battles they had together. The chapter on Robert Houdin was good. It's from a slightly different perspective. It's written from the eyes and of the Londoners who witnessed Houdin's performances in England. Apparently, when Robert-Houdin first began to perform in London he spoke no English. The crowds were not happy with this and according to the book, his solution was to inquire to the audience as to the english name of each item he presented. It became more interactive and the audiences warmed up to him. The chapter on the Davenport Brothers was also interesting. The brothers were extremely popular in America, but in England they often met with resistance and even hostility. I must add that at this moment the Spirit Cabinet holds an extra amount of interest to me because of the recent presentation by Mike Caveney of Charles Carter's Spirit Cabinet at the Los Angeles Conference on Magic History. I was unfamiliar with the routine he presented and it sure opens my eyes to new ideas for this ancient but still wonderful effect. In addition, the Davenport Brothers leads into J.N. Maskelyne, who I always assumed was already famous at this point in time, but that was not the case. His confrontation with the Davenports actually helped to make a name for himself. And for the first time that I can recall reading in print, is an explanation on how the famous Egyptian Hall began. Fascinating stuff to say the least. It's interesting to see the types of entertainment that Victorian audiences appreciated. I was familiar with a great deal of information in this book, yet in every chapter I discovered some new piece of history that I did not know. All in all it's a fine book. I have only seen them for sale on eBay, but they seem to pop up fairly often.